Unlike to other prepaid franking envelope, this printed envelope has its label printed as a stamp. It was delivered to an address in Denmark. 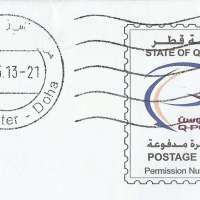 It was sent by Qatar Airways Privilege Club.